One of the most striking halo displays of recent years in the Czech Republic was observed on December 25, 2007 in Destne in the Orlicke Mountains. Diamond dust halo phenomena highlighted the sky shortly after 12 local time (CET) and lasted until sunset. 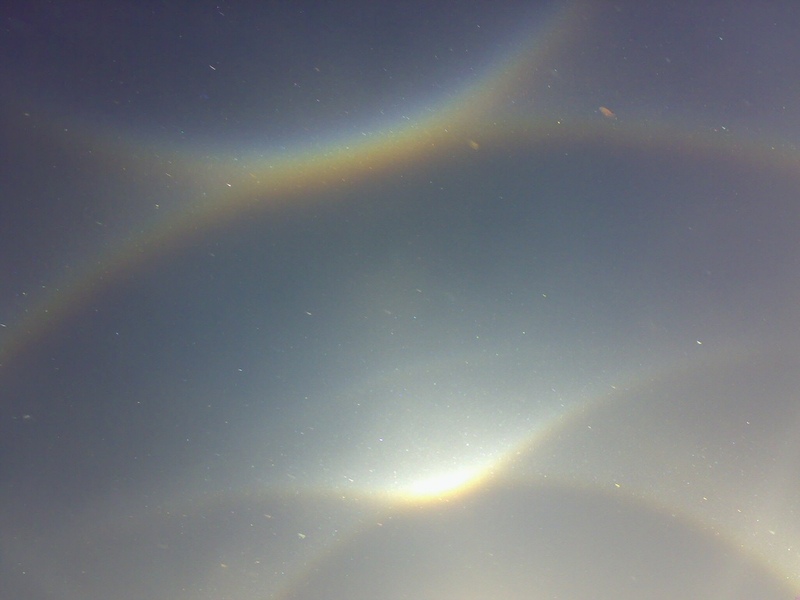 While skiing, Radek Svoboda took several shots with his cell phone camera and captured a variety of halos including ones like Tape arc (Parry supralateral arc) and heliac arc, as shown by the photo beside. See also another image. 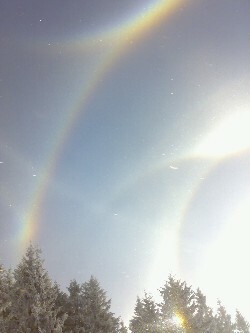 After the inspection of rest of the photos, even diffuse arcs turned up. Some of the images are featured in the gallery, other uploaded halo photographs of Czech observers can be instantly browsed on the latest uploads page. Now this is what display should look like! But how an earth none of those folks in the anthelion photo is looking up in the sky? Quite stunning intensity. Would love to see an allsky image of that. What a staggering Southpole style display. Very classy! I just found this image when I did a Google search for 'rainbow types'. I saw one of these rainbows today (Boston, MA, USA) Don't know how to post a photo on this site but would love to share.